It's been a little while since we've had a guest review, so let's check out a new one. This time around we're checking out the latest hijinks from everyone's favorite plumber pair, Mario and Luigi. This time around Bowser's joined the fray for Mario & Luigi: Bowser's Inside Story. The Mario & Luigi series is arguably Nintendo’s best handheld RPG series. 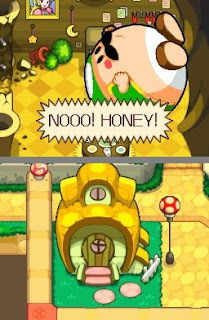 Both Superstar Saga and Partners in Time won fans over with its combination of wacky humor and engaging gameplay. It was only a matter of time until Nintendo and Alphadream released the third chapter in the series, and after an excruciatingly long seven month wait, Mario & Luigi: Bowser’s Inside Story has finally arrived to our shores on the Nintendo DS. Does this title wind up being worth the wait? Without a doubt, my friends. Without a doubt. The Mushroom Kingdom’s once again in danger, but Bowser isn’t the one behind the sinister plot this time! That’s right. No longer content with being Cackletta’s crony or running a Bean ‘n Badge service, Fawful’s moved on up to head honcho status with a daring plan to take over the Mushroom Kingdom! Not only has he infected the populace of Toad Town with a mysterious disease that causes the Toads to swell up into oversized beach balls, but he also tricks Bowser into eating a mushroom that turns the titanic turtle into an oversized vaccum! The king of the Koopas manages to inhale Mario, Luigi, Peach, and everyone else within the confines of the castle. Is this the end for our heroes? Not at all. In fact, it’s just the first ten minutes of a brand new adventure! For Mario & Luigi, the majority of their adventure takes place inside the unfamiliar locale of Bowser’s body, thus the title. 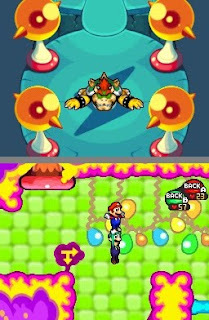 This part of the game unfolds in 2D on the bottom screen with the brothers trying to find a way out of the Koopa King. That might take them awhile though, and it’s looking like the Mushroom Kingdom doesn’t have that long. Never fear. While the brothers might not be able to escape, they can actually aide their longtime nemesis by exploring and using their abilities on the many nooks and crannies tucked away inside of Bowser. For instance, once you get the hammers early on, you’ll soon be in Bowser’s Arm Center using them in a rhythm minigame that has Mario & Luigi volleying energy orbs to charge up Bowser’s arms. There are a few minigame areas like this throughout your adventure and most see action a few times, progressively getting harder with each new encounter. They aren’t long, and outside of one that’s slightly annoying at its most challenging level, they’re a nice break from the action. It’s not a one-way street either, as you can switch to Bowser at most any time on the top screen. 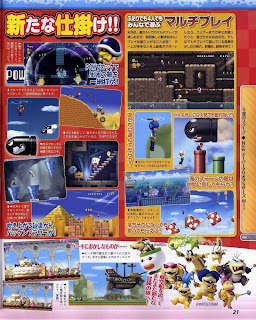 Here, the Koopa King will be able to explore the 3D environments that fans are accustomed to. He might not be as mobile as the Mario Brothers, but he has quite a few tricks of his own to get around. He can use his punch to break down solid stone walls and slide across gaps, use his flame breath to burn down any tree in his way, whatever it takes to keep Fawful from achieving his goal. Bowser will also be able to help the brothers out on their quest (unknowingly). By stopping for a drink at a fountain, an area on the inside will flood allowing Mario & Luigi to swim through what had been previously inaccessible. This inside and out switching mechanic never becomes a chore even with all the times you’ll find yourself flipping from the Bros. to Bowser and vice versa. Battles in Bowser’s Inside Story unfold just like they would in the previous two games. Enemies are seen on the map, and you have a choice whether to engage or avoid them. For Mario & Luigi, they have three ways of attacking. They can either jump (or double jump with good timing), use their hammers to slam their foes down, or team up and use one of the game’s ten special attacks. Being able to use these Bro Attacks successfully is the key to overcoming any and all challengers that come your way. 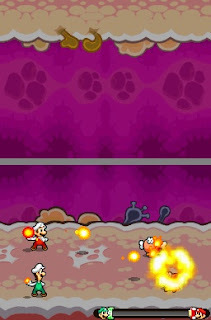 Bowser goes it solo in his fights, so dodging enemy attacks becomes a bit more crucial. 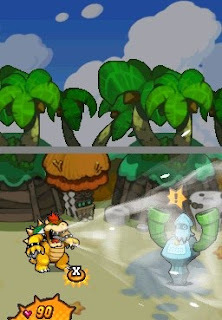 To do this, Bowser can punch his opponents or their projectiles away or just duck and let his shell cancel their attacks. Later on, he’ll be able to use some special attacks of his own using the stylus. These include touching goombas as they run by to light them on fire which causes extra damage, moving the stylus back and forth to get a perfect slingshot attack off, or drawing a line to perfect a Magikoopa spell. The most dramatic use of the stylus comes when Bowser is pushed to his limit. In these rare instances, Bowser will grow into one titanic turtle and force you to turn your DS to the side to witness the battle unfold. Here, you’ll slide the stylus quickly across the screen to land a powerful blow on your equally large foe or blow into the microphone to utilize Bowser’s breath attack. Just like with Mario & Luigi’s minigames, these fights are used just the right the number of times to make them another awesome addition to the game. The gameplay delivers, and I’m glad to say that the soundtrack does as well. Yoko Shimomura of Kingdom Hearts fame returns to compose the music for Bowser’s Inside Story, and it might just be the best in the series. Each area in the game has two pieces of music, one for both inside and outside of Bowser, and I found myself humming along to quite a few of them throughout the journey which wound up being a good 25 hours. Yes, this game has a bit more to it than the previous games, even offering up a couple of optional areas to explore which you should if you want to get your hands on every stat-increasing bean that you can. Even if you don’t, there’s still a 15-20 hour adventure to be had here, making this the longest of the trilogy to complete to date. 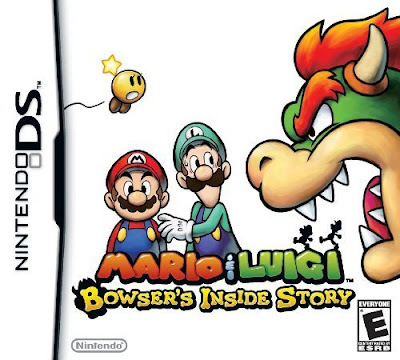 Mario & Luigi: Bowser’s Inside Story manages to take the best ideas from Superstar Saga and Partners in Time to create one of the best titles the DS has to offer, RPG or otherwise. From start to finish, the game has the same charm in both the story and gameplay that its predecessors shared. This is a near perfect title that I’d recommend to anybody, and it’s currently my favorite game that I’ve played this year. Get on the inside track and pick this one up. It won’t disappoint. Interested in more Mario & Luigi? Check out Mario & Luigi: Partners in Time (DS). 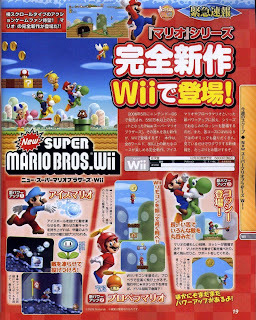 Two new trailers uploaded by GoNintendo have surfaced for the upcoming new 2-D Mario, New Super Mario Bros. Wii. The first is the second official press trailer while the second features some tricky sections of platforming showing how experts play through the game. New Super Mario Bros. Wii jumps and dashes on the Wii November 15th. The Mario madness continues! New Super Mario Bros. Wii is almost a month away. 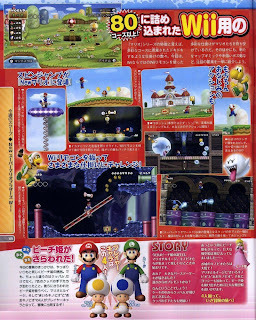 New scans from Japanese magazine Famitsu showcases new level locations, new powers, new enemies, the world map, and the return of the Koopa kids accompanied by Bowser Jr. You can be sure that a review of New Super Mario Bros. Wii will appear on SPC sometime in the latter half of next month. Today is the release date of the much anticipated Mario and Sonic at the Winter Olympics. While Mario and Sonic are having a party in Vancouver, let's revisit one of Mario's solo outings with Mario Party 8 for the Wii. It's his party, and you'll buy if you want to. Seven past console parties down and Mario still feels need to party like its 1999 with a few variations here and there. Mario Party 8 is the series' first foray on the Wii and most likely will not be the last. The Star Carnival has pitched its tent in the Mushroom Kingdom. With it, the carnival brings six new boards, over seventy new minigames, and fourteen characters (two of which being unlockable). But the question is-- does it matter? Well, to put it simply, yes and no. The main modes you'll be cycling through are the Party Tent and Star Battle modes. The Party Tent is your standard Mario Party fare for up to 4 players (CPU or real life buddies). You'll most likely wish to play with friends as the CPU seems to always get the breaks. Nonetheless, the flow of gameplay is relatively simple. You hit the dice by punching the Wii remote forward, rolling any number from 1-10 (and if you're like me you'll usually hit a 1), moving the numbered amount of spaces, and landing on a space. Blue spaces give you coins, red spaces take away a small amount of coins, green spaces are event spaces which trigger a happening on a board (such as a Magikoopa changing the layout of the board in Shyguy's Perplex Express), Lucky Spaces give whoever lands on them a very nice bonus, Bowser Spaces cause the king of the koopas himself to cause havoc to the player or the board, and DK Spaces calls upon DK to lend a hand to players. At the end of each round-- comprised of one turn by each player-- a minigame roulette appears. These games are either a free-for-all, 2 vs 2, or 1 vs 3. It all depends on the space colors everyone has landed on. 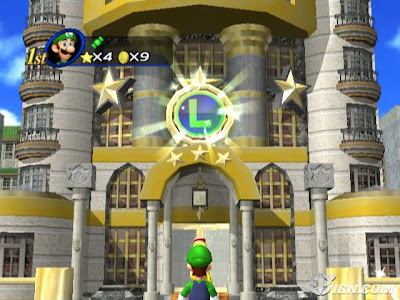 Your aim of this mode is to collect enough coins to purchase stars. The player with the most stars at the end of all of the rounds is crowned the Superstar. Luigi says he's going to strut-- just strut. To mix things up even further is the additional of candy. Candy is used for a variety of measures. Twice and thrice candy allows the player to hit two and three dice blocks respectively. Slowgo candy summons a slower moving dice block that allows you to move 1-5 spaces. Springo candy allows the player to hop to another player's position randomly by way of a dart throw. Cashzap candy shocks your opponent in losing half of his or her coins. Vampire candy steals anywhere from 5-30 coins from each opponent. There's a number of additional candy that offers other services or disservices to the player. Additionally, at the end of every game if selected players will be awarded bonus stars. There are three given out which range from who collected the most coins in mini-games to who consumed the most delectable candy. Carbs are apparently a worry of the past in the Mushroom Kingdom. Boards are varied each featuring a different locale and goal. DK's Treetop Temple is the most traditional board needing players to purchase stars at random locations of the board for 20 coins each, Goomba's Booty Boardwalk requires players to move across the lengthy tropical boardwalk to reach a goomba for a star, King Boo's Haunted Hideaway is a mystical mansion where those who come across King Boo will be able to buy a star from him, Shyguy's Perplex Express is a fast-paced locomotive where those who reach Shyguy in the engine room can get a star, and finally, Koopa's Tycoon Town is where players delve into the world of Monopoly-- buying up vacant and owned hotels to receive the most stars. There's one more map which can be unlocked in Star Battle mode. buying the most hotels that they possibly can to earn stars. Meanwhile, speaking of Star Battle mode, Star Battle is a one on one battle with a CPU opponent on six different boards. Each board has a specific challenge for you to accomplish such as in DK's Treetop Temple where the first player to receive two stars before the other player wins and moves onto the next board. There are no minigames in between rounds. You'll only play Dual Minigames which are one vs. one games where the winner wins a random amount of coins from the other player or Challenge Minigames which are for one-player only. Playing Star Battle is sometimes easier than winning Party Tent mode because you only have one other player to worry about instead of three. Regarding minigames, there's a huge variety of games to play-- over seventy. Most will have you holding the Wii remote like an NES controller while others will have you pointing at the screen to move your character. The best ones use the Wii remote in fun ways such as lassoing barrels in Blazing Lassos or beating the rocks out of a Bowser statue in Punch-a-bunch. 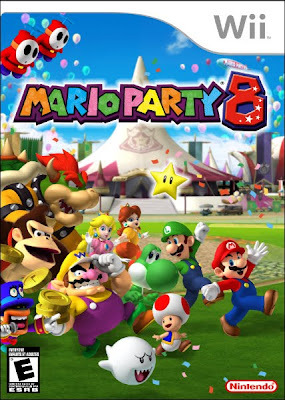 Games like Cut from the Team, however, only further cause annoyance as the lucky will win in already luck-heavy Mario Party 8.
pink boos as you infiltrate this spooky mansion. To round out the package there's the Extra Zone where you can take your Mii and play Mario Party versions of Wii bowling as well as puzzle games with other players or denizens of the Mushroom Kingdom. These aren't too exciting, and there's really not much to these games. Lastly, the Fun Bazaar is where you can spend Carnival Tickets earned by playing the Party Tent and Star Battle modes for buying minigames and figurines. This is apparently how Mario Party 8 encourages replay value as most items are 30 tickets and you only earn 20 per 10 round game. Ultimately there's not too much of a change between this and past Mario games. I personally skipped out on Mario Parties 5-7 as the formula had just run dry. The Wii remote games are fun, but the main game is still way too heavily luck-based which will probably make skilled players become easily frustrated. The CPU seems to always catch breaks while you catch a nice dice roll of 1s. If you're going to play alone, save yourself the trouble and pick up another game. If you have another to play with, however, I encourage you to at least rent this game to try it out. If you're satisfied with the package, then pick it up and party down. Space is the place on this edition of the VGMs. Every song takes place during an outer space level of sorts whether you're soaring through zero gravity, taking out Chaos creatures as Dr. Eggman, or battling an evil alien race. This week we have music from NiGHTS, Super Mario Galaxy, and Star Ocean 3. 'm busy not being able to skip a cutscene, so I'll have to keep this short. This is a twofer on SuperPhillip's Favorite VGMs. 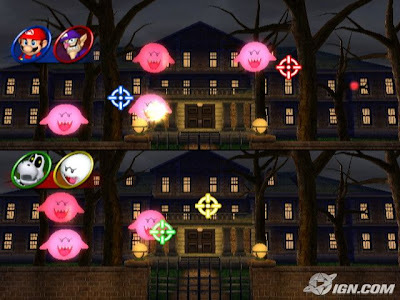 It's the normal and hard versions of Queen Bella's Ball from the adequate NiGHTS: Journey of Dreams for Nintendo Wii. The theme of the first world in Ristar, a character that I'd love to see come back somehow. Then again, with how SEGA treats their classic properties: NiGHTS, Samba de Amigo, Super Monkey Ball, perhaps that's for the best! I'm a huge fan of the piano. I just love the sound of it, so here's a track featuring piano from Super Mario Galaxy's fantastic soundtrack. This poignant space-walking theme plays during the Space Junk Galaxy. Star Ocean: Till the End of Time gets a lot of undeserved hate towards it. I happened to very much enjoy the game. I don't have the time to play through games that take that long now, but when I did play it I liked most of what there was to offer. Being a fan of action-RPGs helped, too. Whereas Shadow the Hedgehog has Cosmic Fall, Sonic Adventure 2 has Eggman's stage called Cosmic Wall. Sonic Adventure 2 remains one of my favorite 3D Sonics, but I guess that's like having a favorite bout of indigestion. Regardless, I enjoyed all the play styles of the game from the fast-paced Sonic and Shadow levels to the tank-shooter Tails and Eggman sections. Head back out of orbit long enough to get a breath of fresh air. That does it for this week's favorite VGMs. Tune in next week for another five great pieces of video game music. A little while we ranked the Mega Man X series from best to worst with the original X taking the crown. Today we'll be continuing this Mario Kart weekend with Rank Up! Mario Kart edition. Put the pedal to the metal, and let's get racing. We've got six competitors duking it out for the number one spot. One of the following games will make the others eat its dust. 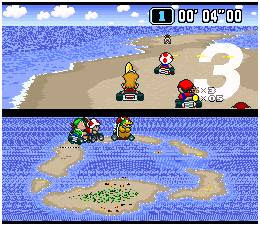 Since its inception on the Super Nintendo, the Mario Kart franchise has appeared on every major Nintendo platform without fail. Each game in the series brings something new to the table more often than not whether it's full 3-D, a partner element, portability, online play, or motion control. Without further ado, let's get this race started. Get ready.... Get set... Go! Let's preface this by saying that there is no sour apple in this bunch. All Mario Karts have one thing or another that make them great. 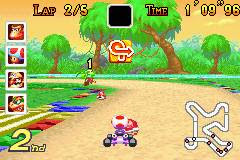 Super Circuit brought the Mario Kart series to portable form with sixteen, new, colorful tracks and Mode-7 visuals. 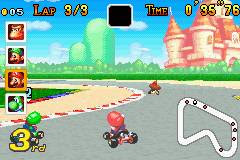 In addition to that, Super Circuit had all of the tracks from the original Mario Kart as an added bonus. That's more than double the tracks. The thing that keeps Super Circuit back in the pack is that multi-player can only happen with two people owning a GBA and a copy of the game each. This isn't as lucrative a prospect as it seems. 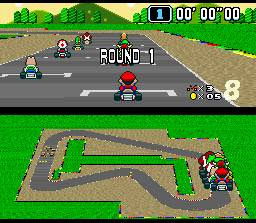 Super Circuit brought Mario Kart to portables, Mario Kart 64 brought the series to true 3-D. Up until Goldeneye 007, Mario Kart 64 was the ultimate destination for multi-player mayhem. 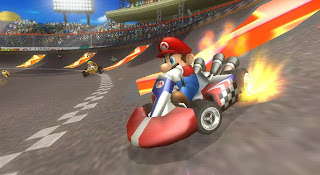 What puts 64 second-to-last is a problem that would plague future entries in the Mario Kart franchise-- rubber-band AI. No, the items wouldn't be your downfall, your opponents would just gain insane bursts of speed to keep up with you. It makes the single-player action less than thrilling and more on the side of frustrating. As for the tracks, there's several memorable courses from the majestic hills and hairpin turns of Royal Raceway to the absolute best incarnation of Bowser's Castle. 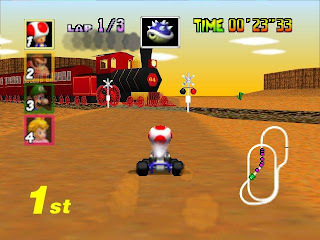 The one that started it all, Super Mario Kart originated the kart racing genre and did it in style. With Mode-7 graphics, allowing faux-3-D on the Super Nintendo, a colorful cast of Mushroom Kingdom all-stars (and Donkey Kong Jr.), and multiple cups filled with hazards, twists, and turns, and Super Mario Kart reigns supreme as a terrific kart racer that outshines imitators to this day. The best-selling Mario Kart of all time, Mario Kart Wii took everything we loved about the series and added cheap item assaults to anger long-time fans. 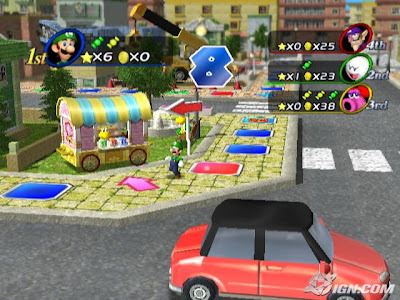 Despite this, the Wii version of Mario Kart had wonderful new tracks from dodging traffic on Moonview Highway to weaving through construction in Toad's Factory. Online play was added which remains one of the best online infrastructures on the system. 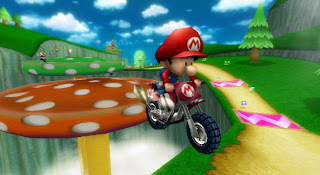 Characters could choose between karts or bikes, and players could choose between motion and traditional controls. There was a host of unlockable characters, sixteen retro tracks from past Mario Karts, and enough curse words from losing first place to spiny shell to make Bowser blush. Two times the characters for twice the fun. The main gameplay elements of Double Dash!! was placing two characters per kart. One character steered while the other was in charge of using items. This brought a whole new package full of strategy with it. Double Dash!! was also the first and only Mario Kart to feature LAN play, double item boxes, and character-specific items such as fireballs and bob-ombs. The selection of tracks is one of the series' best with the hectic and busy seven-lap Baby Park, not-your-mama's-Sunday-drive Mushroom Bridge, the Yoshi-shaped Yoshi Circuit, a ride down the slopes of DK Mountain, and the sharp twists and turns of Wario Colosseum. Double Dash!! takes second place as the catch-up AI was nowhere near as apparent as it was in the following game. In fact, it was hardly there at all. 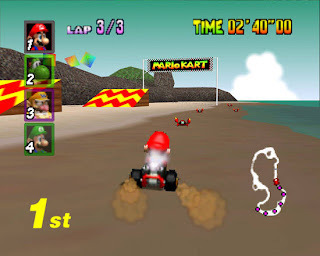 The addition of unlockables and the All-Cup, allowing players to race all sixteen courses in succession, made this Mario Kart one of the best. But not the best. The most complete Mario Kart? It certainly felt like it. Mario Kart DS was a ton of firsts: first for online play in the series, first for a mission mode where you battled bosses and collected coins in various challenges, first for a retro cup where sixteen courses from past Mario Karts were revisited and raced on from Mario Circuit on the SNES to the N64's Choco Mountain, and first for emblems to be proudly placed on karts (for better or worse). The new tracks weren't about to be upstaged by the retro ones, however. They ranged from simple (Figure-Eight Circuit) to complex (Bowser's Castle, Peach Gardens, and Rainbow Road). All of these features plus local play with two friends owning a copy of the game each makes Mario Kart DS first on the podium. And we've arrived at the finish line tonight. Is this list to your liking/disliking? Let us know in the comments section.